The need for timely and reliable mortality estimates is acute in Sub-Saharan Africa (SSA), and about half of all under-five deaths. Yet, there is considerable uncertainty as to mortality changes in the region, because civil registration and vital statistics systems (CRVS) are often incomplete and fail to provide full national coverage. There are few incentives and benefits linked to death registration in countries where life insurance is virtually non-existent, and places of burial largely unrestricted. Overall, less than 50% of deaths are reported in official records, with only a few exceptions (e.g. South Africa) (Mathers et al. 2005). 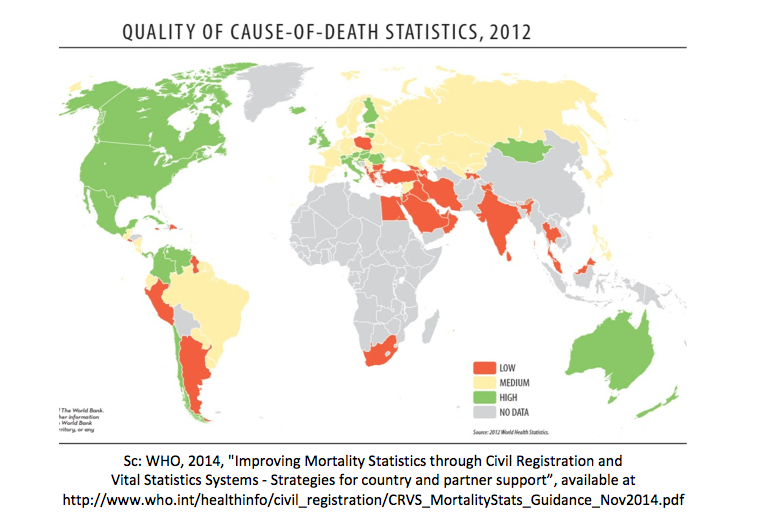 Mortality statistics thus rely heavily on national censuses and surveys as substitutes. Deriving mortality rates from them is challenging because of the infrequency with which they are conducted, not to mention recall errors and selection issues. In addition, these sources do not provide details on the underlying diseases that contribute most directly to the deaths. There is thus little evidence to guide health policies and programs. In-hospital death records are sometimes used but they can be very misleading since people who die at home have socio-demographic profiles and health conditions that differ markedly from those dying in health facilities. There is also a lack of institutionalized mechanisms to establish causes of death for events occurring at home, where the majority of deaths take place. Monitoring progress in the era of the Millennium Development Goals using surveys and censuses was feasible, albeit very difficult. Considerable ingenuity was exercised in extracting estimates of child and maternal mortality from these sources (see for example www.childmortality.org), but the quality and reliability of such estimates remains very poor. The new SDG (Sustainable Development Goals) agenda is much more demanding of detailed and continuous information on deaths by underlying cause, disaggregated by subnational areas and socio-demographic characteristics. For example, one SDG target aims to achieve a one-third reduction in premature mortality from non-communicable diseases by 2030. The probability of dying from cardiovascular disease, cancer, diabetes, or chronic respiratory disease between ages 30 and 70 is the proposed indicator for this target. Yet the WHO (World Health Organization) reports that only one country in SSA was able to provide (low quality) cause-of-death statistics in 2012, raising considerable concerns about the measurement and monitoring of mortality in the SDG era (Figure 1). Complex epidemiological models have been devised by the WHO and academic institutions to compensate for the lack of cause-of-death data. The Global Burden of Disease (GBD) study team provides one of the most comprehensive views of epidemiological changes since 1990 and some argue that its models could serve as the basis for sound and useful monitoring for the SDGs without additional resources (Murray 2015). However, these models are based on a very scant evidence base in Africa (Jha 2014). Mortality estimates would be far more reliable and more relevant for national policy programs if based on a larger set of comprehensive local measurements from CRVS systems. Increasing the completeness of death registration did not make it onto the gargantuan list of SDG indicators (although birth registration did). This objective has nonetheless gained political attention in Sub-Saharan Africa, in the context of the Africa Programme on Accelerated Improvement of Civil Registration and Vital Statistics (APAI-CRVS). In the aftermath of the Ebola epidemic, ministries in charge of civil registration recognized that “real time cause-of-death information is no longer optional but critical”.¹ But if we are to scale up death registration in Sub-Saharan Africa, where should we start? And to begin with, what do we really know about the completeness of death registration today? 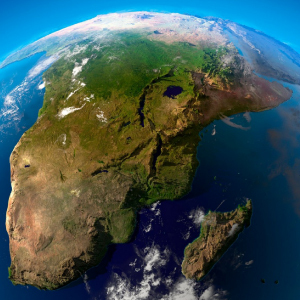 Completeness of death registration in Sub-Saharan Africa: what do we really know? Four broad strategies are currently used to evaluate the share of reported deaths. First, some countries produce self-reported estimates of completeness, which do not necessarily meet the standards of scientific rigor. Other countries use death distribution methods, standard demographic techniques based on the age distribution of deaths and the population. These methods are hazardous to apply in the presence of migration and they are based on strict assumptions, such as a constant underreporting of deaths over a certain age limit (Dorrington 2013). A third approach consists in comparing the number of reported deaths with an estimate of the expected number of deaths (Mathers et al. 2005). Fourthly, the GBD Study uses statistical modelling based in part on the completeness of under-five deaths. Few countries have at least two sources of recent estimates, and when they do, they tend to vary widely, as can be seen in Table 1, for a selected set of countries.² These discrepant numbers call for a more extensive analysis of death registration data, in a collaborative effort between academics, UN institutions and National Statistical Offices. Scaling-up death registration: where do we start? In recent years, there have been decisive strides in building capacities at the national and regional level, and in promoting coordination between various ministries in charge of death registration and other stakeholders. In Africa, such initiatives have been steered by the African Symposium on Statistical Development (ASSD), an annual gathering of heads of statistics offices. Among the key successes of the forum is the crafting of the first-ever continental mortality statistics strategy (2015-2020) under the leadership of WHO and the United Nations Economic Commission for Africa. However, recognizing that progress in the area has been modest so far, we suggest three strategies to scale-up death registration. First, surveillance sites should be more systematically used as platforms for testing methods and supporting the evaluation of quality and completeness of CRVS. In over 20 small geographic areas, called Health and Demographic Surveillance Systems (HDSS), regular household visits are organized to review the composition of all households, and collect data on vital events, marriages and migrations since the last visit (www.indepth-network.org). Causes of death are ascertained based on verbal autopsies. These areas cover populations varying from 8,000 inhabitants (Mlomp, Senegal) to more than 230,000 inhabitants (Kisumu, Kenya). There is a need to develop operational links between these surveillance sites maintained for scientific purposes and the administrative follow-up of the populations in a vital registration system. Second, some urban areas succeed in maintaining high death registration completeness, but the data remain underused. In major cities, deaths must usually be registered to obtain a burial permit. In the center of Antananarivo, Madagascar, death registration is deemed complete (Masquelier et al. 2014). When deaths occur at home (about 60% of deaths), relatives contact the municipality, and a physician is sent to the house of the deceased to consult medical documents and conduct post-mortem interviews with the family. Hospitals or clinics also transmit reports to the municipality. A similar system operates in Bamako, the capital city of Mali (Fargues and Nassour 1988). In Senegal, the last census of 2013 estimated the completeness of death registration in Dakar at 84%, against about 15% in rural areas. It would be a valuable step forward to design national programs that scale up??? these local experiences. Third, more effort is required to improve the quality of cause-of death data in hospitals. If the proportion of age-specific deaths that occur in hospitals can be estimated (from example with partial death registration or HDSS), in-hospital death records could be adjusted accordingly and provide a detailed picture of the distribution of causes of death across the entire country. This strategy has been tested in Mexico (Murray et al. 2007) but other validation studies should evaluate its performance in countries with weaker health systems. Dorrington 2013R. Dorrington. The generalized growth balance method. In T . Moultrie, R. Dorrington, A. Hill, K. Hill, I. Timæus, and B. Zaba, editors, Tools for demographic estimation. Paris: International Union for the Scientific Study of Population, 2013. Fargues and Nassour 1988P. Fargues and O. Nassour. Douze ans de mortalité urbaine au Sahel: Niveaux, tendances, saisons et causes de mortalite à Bamako 1974-1985. Travaux et documents, Cahier de l’INED 123, 1988. Jha 2014P. Jha. Reliable direct measurement of causes of death in low- and middle-income countries. BMC Med, 12: 19, 2014. Masquelier et al. 2014B. Masquelier, D. Waltisperger, O. Ralijaona, G. Pison, and A. Ravelo. The epidemiological transition in Antananarivo, Madagascar: an assessment based on death registers (1900-2012). Glob Health Action, 7: 23237, 2014. Mathers et al. 2005C. Mathers, D. Fat, M. Inoue, C. Rao, and A. Lopez. Counting the dead and what they died from: an assessment of the global status of cause of death data. Bulletin of the World Health Organization, 83: 171–177, 2005. Murray 2015C. J. Murray. Choosing indicators for the health-related SDG targets. Lancet, 386 (10001): 1314–1317, Oct 2015. ¹Sc : IHME estimates are obtained from Mortality Viz, accessed January 7, 2016. UNSD estimates are obtained from Coverage of Birth and Death Registration, accessed January 7, 2016.